Won his first 4 starts as a two year old incl the Somerset Plate (L) and was Gr1 placed twice at 2. This Hail to Reason sire line has been highly successful in SA most recently, Al Mufti and Captain Al. 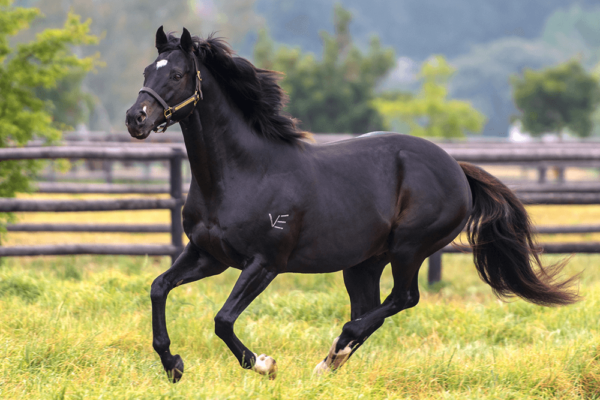 His two time winning dam, Yes She Can Cancan (AUS), has 100% winners – 3 to race, 3 winners – 2x Gr1 winners and the other stakes placed. Damsire Canny Lad (Star Kingdom line) is a Champion 2yo and Gr1 Golden Slipper winner – the world’s richest race for 2yos. Canny Lad sired 52 stakes winners incl 21 Gr1 horses and is the damsire of multiple Gr1 winners. GIMMETHEGREENLIGHT 6 wins-4 at 2-from 1000m to 1600m, R1,355,185, Kenilworth Queen’s P., Gr.1, Somerset P., L, Turffontein Soccer 6 P., 2d Kenilworth Selangor Cup, Gr.2, Cape Classic, Gr.3, 3d Kenilworth J&B Metropolitan H., Gr.1, Greyville Premier’s Champion S., Gr.1, 4th Kenilworth Cape Guineas, Gr.1, Greyville Golden Horseshoe S., Gr.1. He entered stud in South Af in 2012. Leading South African First Season Sire in 2015-16. Sire of 227 progeny to race, 144 winners (63.0%), earnings of over $3.5 million, 16 stakes winners, 18 stakes placegetters, inc. SURCHARGE (14c, Diktat, Shirley Heights). 6 wins-1 at 2-from 1200m to 2000m to 2017-18, R2,765,875, Greyville Daily News 2000 S., Gr.1, Turffontein Tony Ruffel S., Gr.3, Secretariat S., L, Vaal Tellytrack Novice H., Supabets H., 2d Turffontein South African Classic, Gr.1, South African Derby, Gr.1, Gauteng Guineas, Gr.2. GUNNER (13c, Captain Al, Elliodor). 4 wins-2 at 2-at 1000m, 1600m to 2018-19, R687,800, Greyville Premiers Champion S., Gr.1, Racing It’s a Rush H., Youtube Channel Playlist H., 2d Scottsville The White Horse Function Room H., 3d Greyville Golden Horseshoe, Gr.2, Delago Deluxe H.
GREEN PLAINS (14f, Jet Master, Sportsworld). 6 wins-3 at 2-to 1200m to 2018-19, R1,077,500, Turffontein South African Fillies Nursery, Gr.2, Camellia S., Gr.2, Pretty Polly S., Gr.3, Hans Grobler Memorial S., Racing Association S., 2d Scottsville Allan Robertson Championship, Gr.1, Vaal Valentine’s Dinner Dance Book Now Juvenile P., Kenilworth City of Oaks Progress P., 3d Turffontein Man o’ War Sprint, Gr.3, Gardenia S., L.
NATIONAL PARK (15c, Camden Park, Royal Prerogative). 6 wins-2 at 2-at 1400m, 1600m to 2018-19, R1,250,400, Turffontein Gauteng Guineas, Gr.2, Graham Beck S., Gr.3, Fairview Betting World S., 2d Fairview Champion Juvenile Cup, L, 3d Turffontein South African Classic, Gr.1, 4th Turffontein Dingaans H., Gr.2. GIMME SIX (13f, Mujadil, Persian Bold). 4 wins from 1200m to 1600m, R1,146,800, Greyville KZN Fillies Guineas, Gr.2, Umzimkhulu S., Gr.3, Kenilworth Tab 1400 H., 2d Greyville Woolavington 2000, Gr.1, Gold Bracelet, Gr.3, Durbanville Diana S., Gr.3, Vaal Joburg Prawn Fest in April S., Kenilworth Interbet.co.za P., 3d Kenilworth Prix du Cap, Gr.3, 4th Greyville Garden Province S., Gr.1-twice. BARAHIN (15c, Silvano, Fort Wood). 3 wins at 2 in 2017-18, R1,033,625, Greyville Golden Horseshoe, Gr.2, Gatecrasher S., L, 2d Turffontein South African Classic, Gr.1, 3d Turffontein Gauteng Guineas, Gr.2. HACK GREEN (13c, Fort Wood, Bush Telegraph). 4 wins-2 at 2-at 1100m, 1200m to 2017-18, R970,000, Greyville Umkhomazi S., Gr.2, Scottsville South Africa Million Sprint, Greyville Kas Govender Memorial S., 2d Scottsville Racing It’s a Rush P.
ROSE IN BLOOM (14f, Goldkeeper, Jallad). 5 wins-2 at 2-to 1500m to 2018-19, R868,525, Kenilworth Prix du Cap, Gr.3, Turffontein Gardenia S., L, Kenilworth Irridescence S., L, Turffontein Expro United Through Sport P., 2d Kenilworth Sceptre S., Gr.2, Prix du Cap, Gr.3, Sweet Chestnut S., L, Kenilworth Fillies Nursery, L, Durbanville Racing at Its Best Progress P., 3d Kenilworth Majorca S., Gr.1, Western Cape Fillies Championship, Gr.2, Perfect Promise Sprint, L, 4th Kenilworth Sceptre S., Gr.2. GIMME ONE NIGHT (13c, Parade Leader, Priceless Asset). 6 wins from 2000m to 3200m to 2018-19, R664,175, Kenilworth Cape Summer Stayers H., Gr.3, Chairman’s Cup, Gr.3, Tabonline.co.za H., 3d Kenilworth Betting World H., Tab Telebet H., Durbanville Betting World H.
GREEN PEPPER (13f, Fort Wood, Model Man). 5 wins-1 at 2-at 1000m, 1150m, R790,375, Turffontein Magnolia H., Gr.3, Gardenia S., L, Vaal Sophomore 1000, Turffontein Guineas Day in March P., 2d Turffontein Man o’ War Sprint, Gr.3, Scottsville South Africa Million Sprint, Turffontein Tabonline.co.za S., 3d Turffontein Senor Santa S., Gr.2, 4th Turffontein Camellia S., Gr.2. BEATABOUTTHEBUSH (13f, Badger Land, Royal Prerogative). 8 wins-1 at 2-from 1200m to 1600m to 2017-18, R689,100, Fairview East Cape Paddock S., L-twice, Breeders Guineas, L, Tab Telebet S., Mobile Betting at Its Best H., 2d Fairview East Cape Breeders S., L, East Cape Oaks, L, Lady’s Bracelet, L, Betting World S., 4th Fairview East Cape Breeders S., L.
GIMME THE STARS (13c, Jet Master, Jungle Cove). 7 wins from 1400m to 1800m to 2018-19, R566,825, Fairview East Cape Guineas, L, Ibhayi S., L, Founders Trophy, 2d Fairview Interbet.co.za S.-twice, 3d Fairview Founders Trophy. FLANDERS (14c, Captain Al, Western Winter). Champion 2YO Filly in Zimbabwe in 2016-17.6 wins-4 at 2-to 1450m to 2017-18, Borrowdale Thoroughbred Breeders Champagne S., L, Champion Juvenile S., L.
SIMONA (13f, Western Winter, Elliodor). 9 wins from 1200m to 1800m to 2018-19, R158,216, Borrowdale OK Grand Challenge, L, 2d Borrowdale Republic Cup, L, Castle Tankard, L, 3d Borrowdale Ipi Tombe S., L.
QUEEN FOREVER (14f, Jallad, Royal Chalice). 3 wins-2 at 2-at 1200m, 1400m to 2017-18, R286,875, Fairview Lady’s Slipper S., L, Supabets H., 2d Fairview Breeders Guineas, L, East Cape Oaks, L, 4th Fairview East Cape Guineas, L.
STREAM AHEAD (15c, Western Winter, Efisio). 2 wins-1 at 2-at 1200m, 1600m to 2018-19, R203,834, Greyville KZN Guineas Trial, L, Scottsville John McCreedy Juvenile P., 2d Greyville Follow Gold Circle on Facebook Juvenile P., 3d Scottsville AG Hall Juvenile P.
Cash Time (14c, Casey Tibbs, Tara’s Halls). 3 wins-1 at 2-at 1600m, 2000m to 2017-18, R391,425, 2d Turffontein Full Dividend No Limits H., 3d Turffontein Victory Moon S., Gr.3, Derby Trial, L, Joburg’s Prawn Festival in March S., Bring and Braai in September Novice H., Tellytrack.com Novice H., 4th Turffontein South African Derby, Gr.1, Drum Star H., L.
Green Haze (15c, Western Winter, Dancing Champ). 2 wins-1 at 2-at 1000m, 1600m to 2018-19, R283,063, Vaal Happy Festive Season From Racing It’s a Rush P., 2d Greyville Gatecrasher S., L, Turffontein Tab Telebet P., Supabets Assessment P., 3d Turffontein Dingaans H., Gr.2, Tab Telebet P., Bet With the Best Juvenile P.
Loadshedder (13g, Danehill Dancer, Fort Wood). 2 wins at 1600m, R219,925, 3d Kenilworth Winter Guineas, Gr.3, Winter Classic, Gr.3, Silver Mountain H.
Anneka (15f, Western Winter, Trigger Finger). Winner at 2 in 2017-18, R204,025, 2d Turffontein Acacia H., Gr.3, Vaal Betting World P., 3d Turffontein All to Come Assessment P.
Sulka (15c, Model Man, Top Ville). 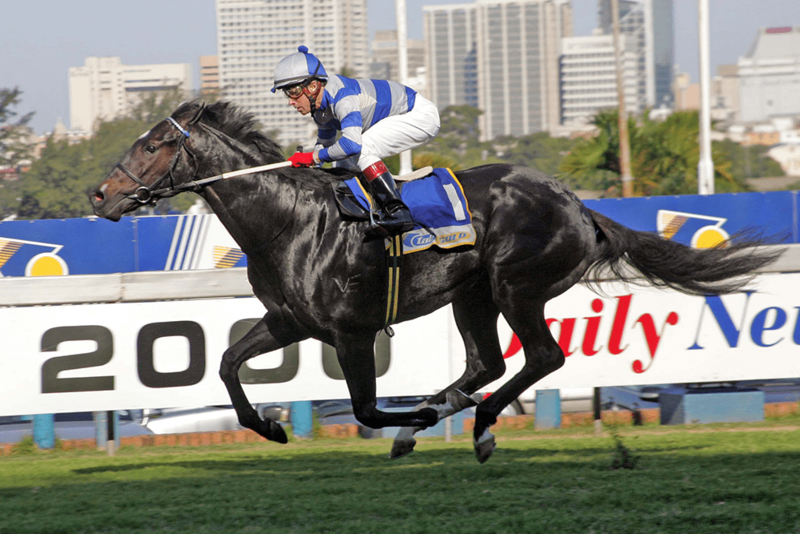 Winner at 2 in 2017-18, 3d Greyville Golden Horseshoe, Gr.2. Light on Her Toes (14f, Western Winter, Badger Land). Winner at 2, R190,500, 3d Greyville Debutante H., Gr.3, Scottsville Epol Equine Feed S., Racing It’s a Rush H., Greyville Autosure H.
Green Top (14f, Caesour, Mecca Road). Winner at 2, R351,825, 2d Turffontein South African Fillies Classic, Gr.1, Vaal Tab Telebet H., 3d Turffontein Gauteng Fillies Guineas, Gr.2, Ken Wright Memorial P.
Skip the Red (13c, Badger’s Drift, Golden Thatch). 6 wins-1 at 2-to 1500m to 2018, R405,476, 2d Scottsville Sentinel S., 3d Greyville Gatecrasher S., L.
Green Lantern (13c, Fort Wood, Elliodor). 5 wins-1 at 2-from 1200m to 1600m to 2018-19, R370,424, 3d Fairview Ibhayi S., L, 4th Fairview East Cape Guineas, L, Racing Association S., L.
Purple Tractor (13c, Fort Wood, Waterville Lake). 5 wins to 1350m to 2018, R438,807, Scottsville Racing It’s a Rush H., 2d Scottsville In Full Flight H., L.
Frederico’s Dream (14f, Linamix, Danehill). 4 wins-2 at 2-at 1000m, 1200m to 2017-18, R376,400, Vaal Tab Pays the Full Dividend No Limits H., Turffontein Book for July Day in Jozi H., Vaal All to Come Juvenile P., 2d Turffontein Swallow S., L, Tab Telebet P., 3d Turffontein Bauhinia H., L, 4th Turffontein Sycamore Sprint, Gr.3. Ready Steady Go (14g, Jet Master, Golden Thatch). 4 wins to 1250m to 2018-19, R328,850, Durbanville Jockey Chase in October H., 2d Kenilworth Jet Master S., L, Interbet.co.za H., Skyy Vodka H., Winter Series in May H., 3d Kenilworth Khaya Stables H.
Legend (13c, Spectrum, Dancing Champ). 4 wins-1 at 2-at 1400m, 1600m to 2017-18, R939,375, Scottsville South Africa Million Mile, Greyville Ems Ref Sol H., GPS Plastics H., 2d Greyville Christmas H., L, 3d Greyville Racing It’s a Rush S., Racing It’s a Rush H.-twice, Igugu H., Durban View Restaurant H.
La Bella Mia (14f, Jet Master, National Assembly). 2 wins-1 at 2-at 1000m, 1150m to 2017-18, R219,850, Turffontein Saturday Citizen H., 2d Greyville Ethekwini Sprint, Turffontein Book for Met in Jozi in Jan Juvenile P., 3d Turffontein Ruffian S., L, World Sports Betting S.
Merit rated 117 at 3 (Highest weighted 3yo in May 2012). MORE THAN READY 7 wins-5 at 2-to 7f, US$1,026,229, Saratoga King’s Bishop S., Gr.1, Gulfstream Park Hutcheson S., Gr.2, Saratoga Sanford S., Gr.2, Belmont Tremont S., Gr.3, Churchill Downs WHAS-11 S., L, Belmont Flash S., L, 2d Keeneland Blue Grass S., Gr.1, Belmont Vosburgh S., Gr.1, Dwyer S., Gr.2, Fair Grounds Louisiana Derby, Gr.2, 3d Belmont Futurity S., Gr.1, 4th Churchill Downs Kentucky Derby, Gr.1, Aqueduct Cigar Mile H., Gr.1, Monmouth Haskell Invitational H., Gr.1. He entered stud in USA in 2001. He entered stud in Aust. in 2001. Leading USA Sire of 2YOs in 2010. Leading Aust. Sire of 2YOs in 2007-08, 2008-09. Second on Aust. Sire List in 2007-08. Third on Aust. Sire List (AEI) in 2007-08. Sire of 2409 progeny to race, 1767 winners (73.0%), earnings of over $216 million, 192 stakes winners, 158 stakes placegetters, inc.
ROY H (12g, Elusive Quality, Taj Alriyadh). Head of the 2018 WTR (Sprint). Equal Leading Older Male on 2017 WTR (Sprint). Champion Male Sprinter in USA in 2017 & 2018.10 wins at 6f, 6½f to 2019, US$2,939,765, 734,000Dhs, Santa Anita Sprint Championship S., Gr.1-twice, Breeders’ Cup Sprint, Gr.1-twice, Belmont True North S., Gr.2, Santa Anita Palos Verdes S., Gr.2-twice, 2d Del Mar Bing Crosby S., Gr.1-twice, 3d Meydan Dubai Golden Shaheen, Gr.1. CATHOLIC BOY (15c, Bernardini, Seeking the Gold). 6 wins-3 at 2-from 7f to 1¼m to 2018, US$1,842,000, Saratoga Travers S., Gr.1, Belmont Derby, Gr.1, Aqueduct Remsen S., Gr.2, Belmont Pennine Ridge S., Gr.3, Saratoga With Anticipation S., Gr.3, 2d Tampa Bay Downs Sam F Davis S., Gr.3, 4th Gulfstream Park Florida Derby, Gr.1, Breeders’ Cup Juvenile Turf, Gr.1. RUSHING FALL (15f, Forestry, Mr. Prospector). 6 wins-3 at 2-from 1m to 9f to 2018, US$1,308,000, Breeders’ Cup Juvenile Fillies Turf, Gr.1, Keeneland Queen Elizabeth II Challenge Cup, Gr.1, Saratoga Lake Placid S., Gr.2, Keeneland Appalachian S., Gr.2, Jessamine S., Gr.3, 2d Churchill Downs Edgewood S., Gr.3. PRIZED ICON (13c, Danehill, Bletchingly). 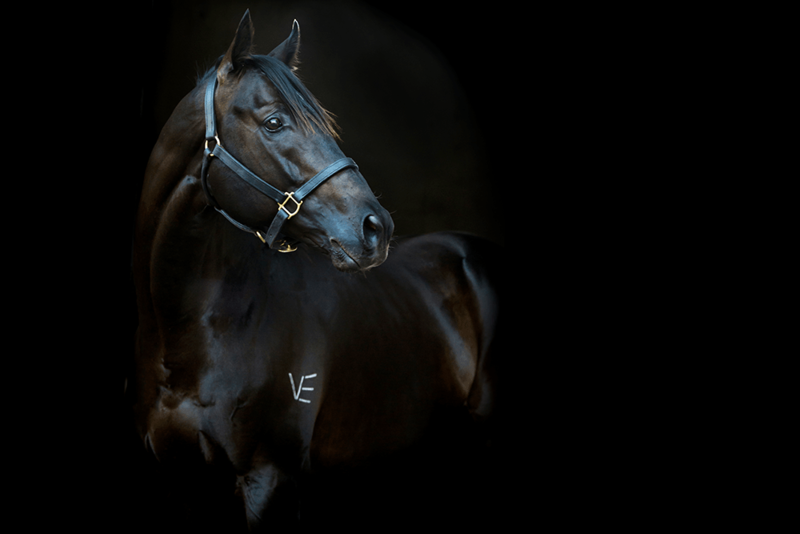 3 wins-2 at 2-at 1600m, 2500m, A$2,167,450, VRC Victoria Derby, Gr.1, ATC Champagne S., Gr.1, Fernhill H., L, 2d VRC Australian Guineas, Gr.1, ATC Chipping Norton S., Gr.1, Tulloch S., Gr.2, MVRC Schweppes Crystal Mile, Gr.2, ATC Schweppervescence H., Gr.3, Scone RC Inglis 3YO Guineas, RL, ATC Carrington S., L, Lonhro P., L, 3d ATC Ranvet S., Gr.1, Spring Champion S., Gr.1, Gloaming S., Gr.3, Canberra RC Black Opal S., Gr.3, ATC Breeders’ P., L, TAB More Than Winning 2YO P., Spring Preview H., 4th VRC LKS Mackinnon S., Gr.1, ATC Apollo S., Gr.2, Up & Coming S., Gr.3. REGALLY READY (07g, King of Kings, Nureyev). 20 wins from 5f to 8½f, US$1,830,437, Woodbine Nearctic S., Gr.1, Breeders’ Cup Turf Sprint S., Gr.2, Churchill Downs Twin Spires Turf Sprint S., Gr.3, Santa Anita San Simeon H., Gr.3, Joe Hernandez S., L, Mountaineer Park West Virginia House of Delegates Speaker’s Cup, L, Santa Anita Big Bear S., L, Churchill Downs Opening Verse S., L, Kentucky Downs More Than Ready Mile S., L, Santa Anita Allowance, Woodbine Allowance, Churchill Downs Allowance, Keeneland Allowance, 3d Santa Anita Arcadia S., Gr.2, Daytona S., Gr.3-twice, Monmouth My Frenchman S., L, 4th Churchill Downs Twin Spires Turf Sprint S., Gr.3, Indiana Grand Warrior Veterans S., L, Arlington Sprint S., L, Kentucky Downs Turf Dash S., L.
EAGLE WAY (12g, Lure, Seattle Dancer). 8 wins from 1600m to 2400m to 2018-19, A$517,750, HK$16,737,500, BRC Queensland Derby, Gr.1, HKJC BOCHK Jockey Club Cup, Gr.2, Queen Mother Memorial Cup, Gr.3, January Cup, Gr.3, BRC Sky Racing H., SCTC Coastline BMW H., HKJC Eishin Preston H., 2d BRC Grand Prix S., Gr.3, HKJC Happy Valley Vase H., Jinbao Street H., 3d HKJC Audemars Piguet Queen Elizabeth II Cup, Gr.1, Standard Chartered Champions & Chater Cup, Gr.1, Oriental Watch Sha Tin Trophy, Gr.2, Sa Sa Ladies’ Purse, Gr.3, Centenary Vase, Gr.3, 4th HKJC Longines Hong Kong Vase, Gr.1, Standard Chartered Champions & Chater Cup, Gr.1, BRC Rough Habit P., Gr.3, HKJC Queen Mother Memorial Cup, Gr.3, Hong Kong Classic Cup, L.
UNI (14f, Dansili, Generous). 7 wins from 1500m to 1800m to 2018, €58,300, US$830,000, Del Mar Matriarch S., Gr.1, Belmont Sands Point S., Gr.2, Noble Damsel S., Gr.3, Maisons-Laffitte Prix Matchem, L, Saratoga De la Rose S., L, Aqueduct Plenty of Grace S., L, Deauville Prix d’Epreville, 2d Saratoga Lake Placid S., Gr.2, Chantilly Prix du Vivier Madame, Deauville Prix de la Placiere, 3d Belmont Oaks, Gr.1, Cagnes-sur-Mer Prix de la Californie, L, 4th Keeneland Queen Elizabeth Ii Challenge Cup, Gr.1. GIMMETHEGREENLIGHT (08c, Canny Lad, Marauding). 6 wins-4 at 2-from 1000m to 1600m, R1,355,185, Kenilworth Queen’s P., Gr.1, Somerset P., L, Turffontein Soccer 6 P., 2d Kenilworth Selangor Cup, Gr.2, Cape Classic, Gr.3, 3d Kenilworth J&B Metropolitan H., Gr.1, Greyville Premier’s Champion S., Gr.1, 4th Kenilworth Cape Guineas, Gr.1, Greyville Golden Horseshoe S., Gr.1. PHELAN READY (06g, Blevic, At Talaq). Champion 2YO in Australia in 2009.4 wins-2 at 2-at 1200m, 1400m, A$3,772,350, STC Golden Slipper S., Gr.1, GCTC Magic Millions 2YO Classic, RL, BRC XXXX Gold H., Desleigh Forster Racing H., 2d MVRC Manikato S., Gr.1, STC Todman S., Gr.2, BRC QTC Cup, Gr.2, George Moore S., Gr.3, GCTC Magic Millions Cup, RL, BRC Keith Noud H., L, 3d STC Premiere S., Gr.2, BRC Lough Neagh S., L, MRC Testa Rossa S., L, QTC JF Meynink S., L, GCTC Prime Minister’s Cup, L, Goldmarket H., L, SCTC Glasshouse H., L, 4th VRC Newmarket H., Gr.1, Bobbie Lewis H., Gr.3, Gold Coast Guineas, Gr.3, BRC Lough Neagh S., L, BTC Tommy Smith Slipper, L.
READY’S GAL (02f, Nasty and Bold, Search for Gold). 7 wins-2 at 2-from 5f to 9f, US$609,959, Woodbine Canadian S., Gr.2, Saratoga Lake George S., Gr.3, Monmouth Matchmaker S., Gr.3, Tampa Bay Downs Hillsborough S., Gr.3, Monmouth Little Silver S., L, Saratoga Allowance, 2d Belmont Frizette S., Gr.1, 3d Meadowlands Miss Liberty S., L.
MORE STRAWBERRIES (07f, Strawberry Road, Mr. Prospector). 4 wins to 1500m, A$843,200, STC Tea Rose S., Gr.2, NSW Tatt’s RC Furious S., Gr.2, Hawkesbury RC Darley Crown, L, Newcastle JC Tibbie S., L, 2d AJC Flight S., Gr.1, STC Magic Night S., Gr.2, AJC Lansdowne 2YO H., 3d STC Golden Slipper S., Gr.1, ATC Triscay S., L, 4th ATC Surround S., Gr.2, AJC Silver Shadow S., Gr.3. MORE THAN WORDS (14c, Silver Planet, Engrillado). 8 wins from 1300m to 2000m to 2018-19, Monterrico Clasico Almirante Miguel Grau Seminario, Gr.2, Clasico Pedro García Miró, Gr.3, Clasico Baldomero Aspíllaga, Gr.3, 2d Monterrico Clasico Ciudad de Lima, Gr.2, Clasico Batalla de Tarapacá, L.
TOM’S READY (13c, Broad Brush, Deputy Minister). 5 wins-1 at 2-at 7f, 1m, US$1,036,267, Belmont Woody Stephens S., Gr.2, Bold Ruler H., Gr.3, Churchill Downs Ack Ack H., Gr.3, Presque Isle Downs Leemat S., L, 2d Fair Grounds Louisiana Derby, Gr.2, Lecomte S., Gr.3, Churchill Downs Street Sense S., L, 3d Saratoga Forego S., Gr.1, Belmont Kelso H., Gr.2, Churchill Downs S., Gr.2. MADE YOU LOOK (14c, Unbridled’s Song, Rahy). 4 wins-2 at 2-from 6f to 8½f to 2018, US$411,797, Saratoga With Anticipation S., Gr.2, Gulfstream Park Dania Beach S., Gr.3, 2d Belmont Poker S., Gr.3, 3d Gulfstream Park Kitten’s Joy S., L, 4th Saratoga Fourstardave H., Gr.1, Woodbine Charlie Barley S., L.
EKTIFAA (13f, Redoute’s Choice, Varick). 4 wins to 1450m, R565,000, Kenilworth Choice Carriers Championship, Gr.2, Turffontein Tony Ruffel S., Gr.3, Spectracare H.
MARY’S FOLLIES (06f, Miswaki, Wavering Monarch). 4 wins at 6f, 8½f, US$338,889, Churchill Downs Mrs Revere S., Gr.2, Monmouth Boiling Springs S., Gr.3, 2d Saratoga Lake George S., Gr.3, Belmont Athenia S., Gr.3, Monmouth Just Smashing S., L.
FRITZ’S PRINCESS (02f, Canny Lad, Red Anchor). 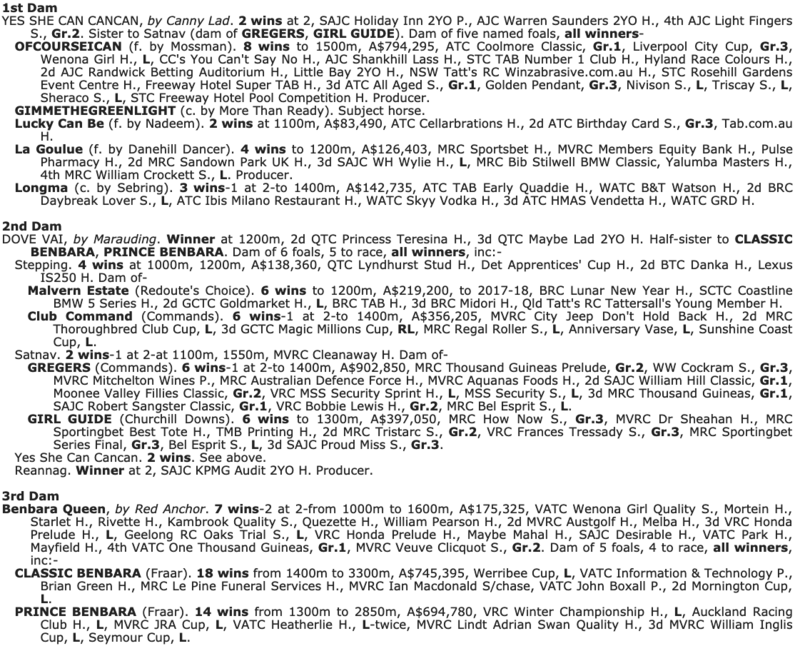 9 wins-1 at 2-to 1300m, A$707,370, AJC Shorts H., Gr.2, GCTC Paspaley Magic Millions H., AJC Bronte Welter H., McGrath Real Estate H., STC WSFM H., Angostura Bitters H., Franklins Supermarket H., 2d Qld Tatt’s RC Winter S., Gr.1, AJC Shorts H., Gr.2, STC Triscay S., L, QTC Lightning H., L, City Tatt’s RC A Friend’s Place H., STC AAMI Golden Slipper Day H., 3d AJC Galaxy H., Gr.1, Sapphire S., Gr.2, STC Civic S., L, Scone RC Dark Jewel Classic, L, Wyong RC Strawberry Hill Slipper S., AJC Kinglock H., STC Konica Minolta H., 4th STC Premiere S., Gr.2, Missile S., Gr.3, AJC PJ Bell H., L.
COPPER BULLET (15c, Unbridled’s Song, Peintre Celebre). 3 wins-2 at 2-to 7f to 2018, US$327,345, Saratoga Special S., Gr.2, Churchill Downs Allowance, 2d Churchill Downs Bashford Manor S., Gr.3, Oaklawn Park Razorback H., Gr.3. BRIGHTEXPECTATIONS (07c, Unbridled’s Song, Danehill). 2 wins at 2, A$290,950, STC Pago Pago S., Gr.2, Magic Millions Wyong 2YO Slipper S., 2d AJC Skyline S., Gr.3, 4th VRC Maribyrnong P., Gr.3, BRC Vo Rogue P., Gr.3. AUGUSTA PROUD (05f, Langfuhr, Cryptoclearance). 9 wins-6 at 2-to 1200m, A$1,739,028, SAJC Breeders’ S., Gr.3, RN Irwin S., Gr.3, GCTC Magic Millions 2YO Classic S., RL, SAJC Dermody Lightning S., L, Queen Adelaide S., L, Magic Millions 2YO Classic, Alan Scott Park Morphettville H., Biodiesel 2YO P., MVRC City Pacific Finance 2YO P., 2d SAJC DC McKay S., Gr.3, Redelva S., L, WH Wylie H., L, 3d SAJC DC McKay S., Gr.3, VRC Straight Six H., L, MVRC William Crockett S., L, SAJC Proud Miss S., L, 4th SAJC Goodwood H., Gr.1. READYTOGORIGHTNOW (09g, Hurricane Sky, Mighty Kingdom). 7 wins from 1200m to 1800m, R685,670, Kenilworth Winter Classic, Gr.3, Winter Guineas, Gr.3, Fairview Memorial Mile, L, Kenilworth Pinnacle S., Racing It’s a Rush P., 2d Durbanville Aviation Insurance S., 3d Kenilworth Cape Classic, Gr.3, Fairview Racing It’s a Rush S., 4th Greyville Champions Cup, Gr.1, Clairwood Cup Trial, Gr.3, Kenilworth Jet Master S., L.
MAHISARA (08c, Danehill, Last Tycoon). 7 wins-3 at 2-to 1500m, A$528,890, MRC Sandown S., Gr.3-twice, Qld Tatt’s RC Australia Post S., L, VRC Headquarters Tavern P., ATC Iconic Race H., TJ’s Champagne Bar 2YO H., 2d BRC Sprint H., Gr.3, VRC Hilton Hotels S., L, BRC Dalrello S., L, 3d BRC Sires’ Produce S., Gr.2, ATC Brian Crowley S., L, 4th GCTC Prime Minister’s Cup, L.
NAYELI (11f, Danehill, Centaine). 4 wins-2 at 2-to 1200m, A$352,975, MRC Chairman’s S., Gr.3, City Tatt’s RC Nivison S., Gr.3, ATC Fireball S., L, Membership on Sale 2YO P., 2d Scone RC Inglis Guineas, RL. 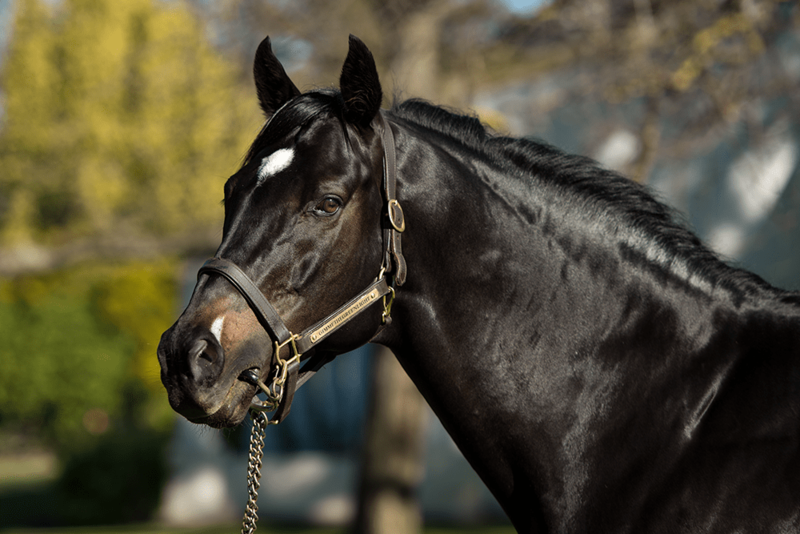 His sire sons include Sebring (52), Gimmethegreenlight (16), Perfectly Ready (7), Ready’s Image (7), Custom for Carlos (6), Pluck, Verrazano, Benicio, Better Than Ready, Ready As, etc. CANNY LAD Champion 2YO in Aust/NZ. 8 wins-6 at 2-from 900m to 1600m, A$2,069,900, STC Golden Slipper S., Gr.1, VRC Sires’ Produce S., Gr.1, Maribyrnong P., Gr.2, MVRC Bill Stutt S., Gr.2, VATC Autumn S., Gr.3, Blue Diamond Prelude, Gr.3, Debutant S., Gr.3, VRC Maribyrnong Trial S., L, 2d VATC Blue Diamond S., Gr.1, 3d MVRC WS Cox P., Gr.1, VRC Ascot Vale S., Gr.2. Sire of winners of over $57 million – 55 stakes winners, inc. CANNSEA, ANCIENT SONG, PRESERVE, SMALL MINDS, CALVEEN, ACCOMPLICE, DODGE, REPUBLIC LASS, ALLEZ SUEZ, HE’S NO PIE EATER, etc. 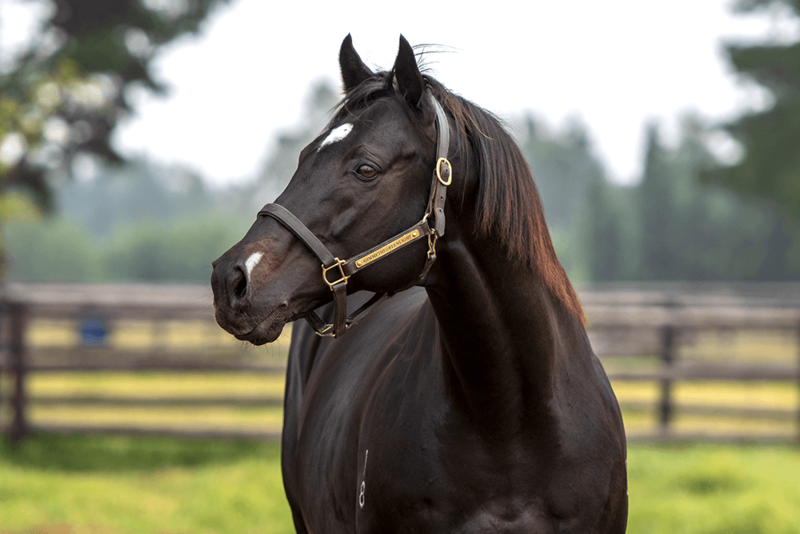 Maternal sire of winners of over $107 million – 77 stakes winners, inc. DESERT WAR, THE CONGLOMERATE, KUSI, OFCOURSEICAN, PLATINUM SCISSORS, REDOUTE’S CHOICE, MNEMOSYNE, MANHATTAN RAIN, GIMMETHEGREENLIGHT, NEROLI. It is rare for a mare to produce a Gr1 winner. For her to produce more than one has statistically a chance close to zero. So when two-time winning miler Yes She Can Cancan hit the boards with a Gr1 winning brother and sister following a stakes placed other sister, from just three runners by different sires, she caused a stir. Something had to be going on in her pedigree. Yes She Can Cancan is one of four winners for her dam Dove Vai, and one of three full sisters and a 3-part sister. Dove Vai in turn is half sister to two stakes winning staying full brothers (who won 32 races between them), with the next dam Benbara Queen a 7-time winner who placed fourth in the Gr1 Australian One Thousand Guineas. Three generations further back is the mare Victory Piper, also the female line ancestor of Australian champion 3yo and 4yo filly (and Horse of the Year) Emancipation, whose granddaughter Virage de Fortune was champion 3yo filly in 2006. In terms of female-line kin-breeding there are close similarities between these two branches of the female line. The theory of female-line kin-breeding centres on interaction of female ancestors whose pedigrees contain a high proportion of the same elements. Kin-breeding in the general horse population is random – any representative sample will show that half are kin-bred, the other half not. Of the kin-bred half, less than 10% has kin-breeding 4×4 or closer. Sampling of ‘better’ horses changes that pattern. Worldwide, as the quality increases, so does the incidence of kin-breeding, as well as the percentage of horses kin-bred 4×4 and closer. The threshold among randomly sampled stallions at stud, and premier-sale mares and yearlings, is about 70% kin-bred, with 25% at 4×4 or closer. The killer category is that of champions from the last 50 years, of which a sample shows that 95% have dams who are kinbred, with 80% of these dams kinbred 4×4 or closer. Often the grandams of these champions show similar kin-breeding, followed by an unbroken chain of consecutive kinbred ancestors stretching back far. Kin-breeding appears to centre on significant female line ancestors, whose influence can last for many generations. The common female line ancestor of earlier mentioned champions Emancipation and her granddaughter Virage de Fortune on the one hand, and Yes She Can Cancan on the other, is the mare Victory Piper (by Pipe of Peace out of Sweet Victory). Victory Piper remained a maiden, but became dam of Hartshill, the leading Australian 2yo of her year. Victory Piper is kinbred 2×1 Red Briar (dam of Pipe of Peace) x Sweet Victory, and also 2×2 Red Briar x Victory Flight (dam of Sweet Victory). This kin-breeding is extended in Yes She Can Cancan’s grandam Benbara Queen (stakes placed dam of two stakes winners). Benbara Queen is by Red Anchor, whose grandam Red Robe is full sister to Pipe Of Peace. Add lines from Red Anchor damsire Decoy Boy to those of his grandam Red Robe, and the dam of Red Anchor makes for kin-breeding with Victory Piper, 2×3 in Benbara Queen. The significant female line ancestor in the female line is Victory Piper’s third dam Oriens, a daughter of Hyperion, and herself kinbred 2×1 and 3×2, involving Hyperion’s dam Selene and grandam Serenissima. Victory Piper’s champion 2yo daughter Hartshill is kinbred 2×4 Alice Delysia (a daughter of Alycidon) x Oriens. Now compare Emancipation. She’s a daughter of Bletchingly, by Biscay. Bletchingly is kinbred 3×2 Magic Wonder x Last Judgement. Both are kin to Victory Piper’s dam Sweet Victory. Magic Wonder and Sweet Victory are daughters of stallion Newtown Wonder, who appears a third time, in the pedigree of Emancipation’s damsire Gunsynd. The latter is close kin to Bletchingly’s sire Biscay to boot. Emancipation was mated to Kenmare, whose third dam Geifang Belle is close kin to the bottom- line pair of Red Briar and Sweet Victory (they are 2×1 in Victory Piper). 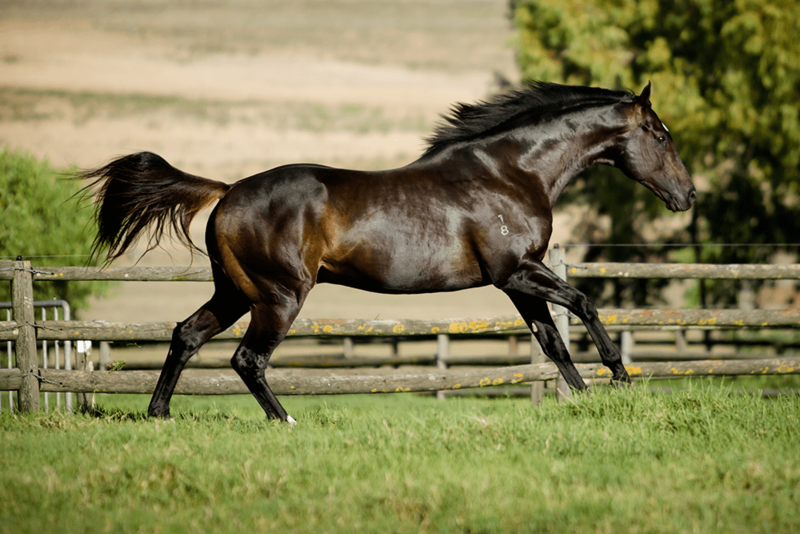 The resulting mare Virage is dam of champion Virage de Fortune, by Anabaa, who gives remote kin-breeding through Oriens. There’s an interesting parallel here with champion race filly Goldikova, who also is by Anabaa. Goldikova’s bottom female line goes to Tudor Gleam, who is 3-part sister to Red Briar (they are by Owen Tudor out of Infra Red, and Owen Tudor out of daughter of Infra Red). Tudor Gleam is very close kin to Sweet Victory and also to Victory Piper (who is 2×1 Red Briar x Sweet Victory). Goldikova’s dam and third dam are kinbred through Tudor Gleam, and in-between Goldikova’s grandam is kinbred through Infra Red (dam of Red Briar). Whereas Emancipation is by Bletchingly, Yes She Can Cancan is by Canny Lad, a son of Bletchingly. Canny Lad is kinbred 3×2 Last Judgement x Beautiful Dreamer, who are both kin to Sweet Victory. This repeats the kin-links found in Emancipation. Just as Anabaa gave kin-breeding through the female line’s significant ancestor Oriens, so does More Than Ready’s bottom female-line ancestor La Troienne go to Oriens is the mating with Yes She Can Cancan which gave Gimmethegreenlight. The links are remote, but significant. Gimmethegreenlight’s Gr1 winning half sister Ofcourseican is by Mossman, whose fourth dam Margaret Ann is very close kin to Victory Piper. Victory Piper may well hold the key. Mares who have multiples of the closeup lines from her pedigree should be the ones to look out for. Victory Piper’s sire Pipe of Peace is by Supreme Court out of Red Briar, and kinbred 2×1 Forecourt x Red Briar and 3×2 Overture x Infra Red. This gives an interesting link to Jallad, a son of Blushing Groom, from the Infra Red female line. Jallad is kinbred 3×3 Aimee x Ajasco, bottom-line grandams of sire and dam. Ajasco is out of a daughter of Llanstephan, the latter by Dante out of Gadabout, by Gainsborough out of Arabella. Dante’s full brother Sayajirao and Arabella are in Victory Piper. In a nutshell, Jallad’s kin-breeding of Aimee x Ajasco goes straight to Victory Piper. It is notable that the earlier mentioned champion Goldikova is out of a mare by Blushing Groom. Jallad’s female line is represented in South Africa, not only in champion Princess Victoria, but also in the mare Platinum Lass, who comes with a double, as she is by Jallad. Blushing Groom is also found in Rainbow Quest, who is kin-bred 3×3 Aimee x Noblesse, both kin to Victory Piper and Red Briar. Rainbow Quest’s son Saumarez is 4x4x1 Aimee x Noblesse x Fiesta Fun, who all link in the same way. Rainbow Quest’s son Spectrum also fits the pattern. There will be others, with Blushing Groom as sire of females. Red Briar’s dam Infra Red is a daughter of Black Ray. This female line is not only the one of Blushing Groom, but also of Khaled (kinbred 2×1 Selene x Éclair; sire of Swaps, who is kinbred 3x2x4 Selene x Éclair x Uncle’s Lassie). Swaps is significant in the female line of Fort Wood, where he’s sire of second dam Change Water. Red Briar’s three-part sister Red Ray is ancestress of Mill Reef. Red Briar is the third dam of Bel Byou. Also on the bottom-line of the pedigree is Victory Piper’s daughter Lunar Queen. She’s by Mount Hagen, whose second dam Sunset is kin to Red Briar and to Oriens. 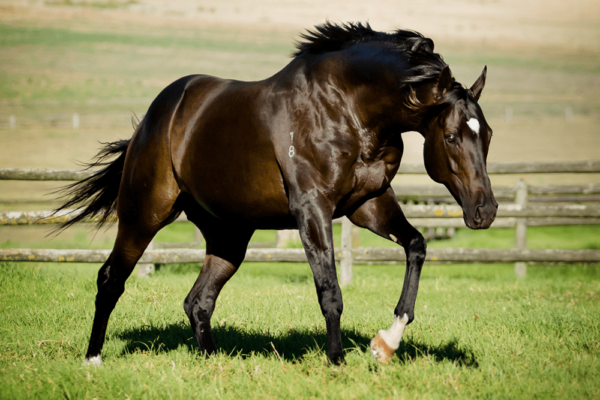 Mount Hagen stood for several years at Summerhill and can be found in SA female lines, as well as in the pedigrees of some major international sire-lines. Supreme Court’s female line of Overture (tracing to Pretty Polly) can be found in Preamble, Tara’s Halls, Alan Adare – to mention but a few. 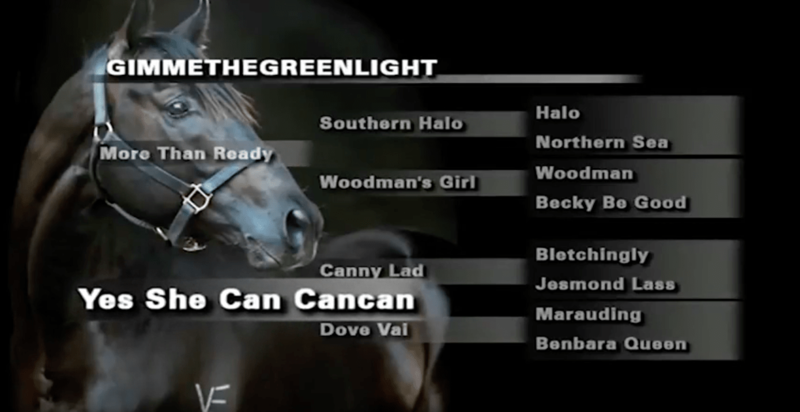 What of the influence of Gimmethegreenlight’s sire More Than Ready? More Than Ready is sire of Gr1 winners, and in the South African context best known as sire of Breeders Cup Juvenile winner Pluck, bred by Varsfontein (where Gimmethegreenlight starts his stud career). Pluck, whose dam is by Fort Wood, comes from the Soho Secret female line, and is kinbred 4×4 Good Landing x Secret Landing (dam of Soho Secret), both mares daughters of First Landing. Gimmethegreenlight will no doubt get lines from this female line, which is interesting as his significant ancestor Oriens kin-links to the Soho Secret female line (through the mare Iona). It’s remote, but looks significant. There’s also the fact that More Than Ready’s dam Woodman’s Girl is kinbred 2×2 Playmate x Good Landing, both mares tracing to La Troienne. To what extent kin-linking to La Troienne will assist Gimmiethegreenlight may well depend on what other lines that famous mare is combined with. Blushing Groom, notably Jallad (and his female line, the Petrava family), Rainbow Quest (Saumarez, Spectrum), & Blushing Groom as sire of females.